Your college wall decor is great for adding scenic views to your dorm room. You don't have to have only photographs of your favorite celebrities in your college posters. You can also add dorm wall art of places you love or even dorm posters of places that remind you of home to help battle homesickness that may occur. Scenic dorm room posters can do a lot more for your dorm room decor than you may realize. They'll provide relaxing dorm room decorations and have a nice way of uniting all of your dorm necessities together for a unified look that will make your dorm room decor pop. Our ASSAF FRANK New York Dorm Room Poster is a gorgeous dorm room decorations item. It has a simple photo of the Brooklyn Bridge leading into New York City which is in the backdrop. The effect of this dorm essentials item is what makes it truly unique and stunning. This college supplies item has a grayscale effect so the sky and water are a deep gray that will make your other dorm necessities pop with color against this college wall decor item. 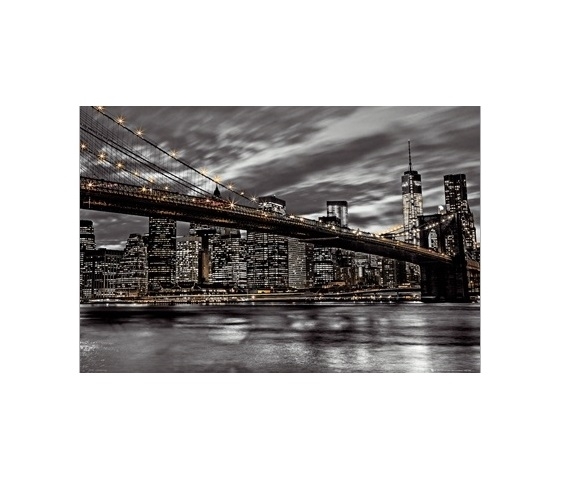 The lights of the Brooklyn Bridge and the New York City Skyline pop against the dark tones of this gorgeous dorm item. Make your dorm room decor stunning with scenic dorm posters like our ASSAF FRANK New York College Poster in your dorm wall art!